The SeeRisk Report is a comprehensive report prepared on foreign companies, detailing all available information that could potentially drive a decision on credit or business transactions in general. It offers a list of countries for which data on companies is readily available, as well as an on-demand service for requesting risk reports on companies that fall outside the areas where the Creditinfo Group operates. The scope of information that will be provided is governed by filing requirements for the country in which the subject company is registered. We also offer reports for companies registered in countries where the Creditinfo Group has established global partnerships. 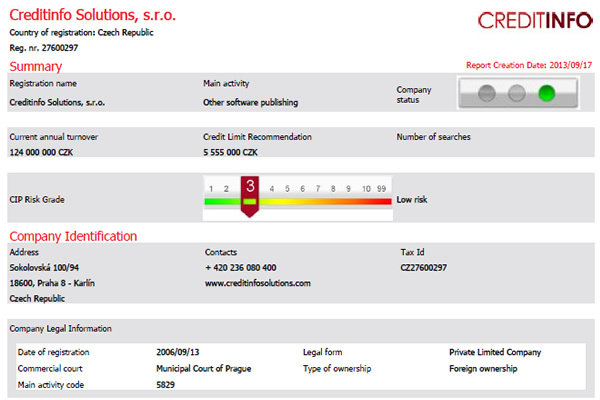 Where possible, we can also provide the Creditinfo Group’s easily understood numeric risk assessment Predictor© Score, which is based on an analysis of all available historic information.